To get the fullest view of what Propolis is, we need to take a look at two different perspectives: the Bee’s and human’s. Propolis is a waxy resin that Bees collect from the resinous sap from a number of different plants using their mandibles. This resin is mixed with Bee saliva and then added to Beeswax. This is no simple feat; it takes a colony of Bees about one year to collect 150 – 200 g of Propolis. It was originally thought that the Bees used Propolis primarily for structural support but we now know that the hive uses Propolis for a number of purposes. Bees will surround the carcass of any hive invader once it has been killed to keep the body from breaking down and threatening the health of the hive. It is also thought that Propolis is used in order to maintain the temperature of the hive as well as to fill any cracks or holes. 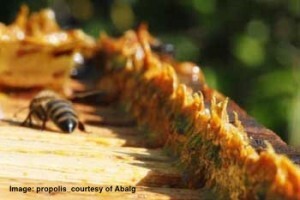 The Bees employ Propolis as a sort of “immune system” for the hive. Imagine if you would, hundreds, if not thousands, of people living together in one enclosed space. You can easily see how one person getting a sniffle could quickly fly through this community. And so it is with Bees; by using Propolis they are actually able to make the crowded space of the hive one of the cleanest environments in nature. Interestingly, this application does not seem to be by chance or coincidental. One study had researchers paint the inside of two out of three Beehive boxes with Propolis. After seven days Bees were gathered and their immune systems were examined. What researchers discovered was that in the Propolis painted hives the Bees had a lower bacterial load as well as a quieter immune system. To find out if Bees knew that Propolis provides this protection a separate study looked at introducing a disease into the hive. Here researchers found that the Bees actually gathered more Propolis when the hive was challenged with this threat. This is why the Bees line the entrance to their hive – it acts as a “Bee – wash” for all returning Bees to make sure they are not bringing any infections back to the hive. In fact this is where the word ”Propolis” comes from; “pro-” from the Greek meaning “in front of” and “polis” denoting “city”.